Oh noes! Only one exam left, and I’m already with my head in the clouds. 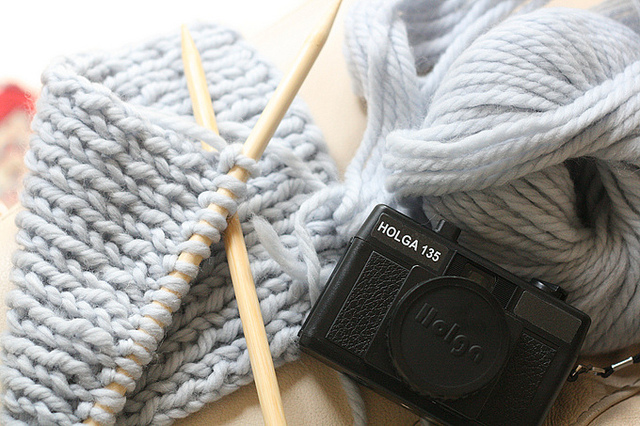 My new Holga 135 arrived in the mail today, aaaaand I’ve already started knitting a scarf for this winter. If it was possible to get a medal for procratinating… I should’ve gotten it by now I guess. The idea for this scarf with Rowan wool is from Park and Cube, you might remember if you’ve been following her blog (here!). I loved the texture of Rowan’s big wool, and after finding it in a local store, decided to give it a go. I am ridiculously slow at knitting, and even this easy ribbing stitch: knit, yarn over, purl, knit, yarn over, purl, etc is so confusing at times! Hereby, I highly respect those who dare knitting clothes… or socks… or gloves. – Hopefully I can finish before Christmas… Are you all aware it’s only 7 Fridays to go? !